Bull Nose Shelving in Solid Colors, Black, 13" x 24"
Bull Nose Shelving in Solid Colors, Black, 13" x 48"
Bull Nose Shelving in Solid Colors, White, 13" x 24"
Bull Nose Shelving in Solid Colors, White, 13" x 48"
Bull Nose Shelving in Solid Colors, Black, 13" x 36"
Bull Nose Shelving in Solid Colors, White, 13" x 36"
Bull Nose Shelving in Solid Colors, Gray, 13" x 24"
Bull Nose Shelving in Solid Colors, Almond, 13" x 24"
Bull Nose Shelving in Solid Colors, Black, 13" x 30"
Bull Nose Shelving in Solid Colors, White, 13" x 30"
Bull Nose Shelving in Solid Colors, Gray, 13" x 48"
Bull Nose Shelving in Solid Colors, Almond, 13" x 36"
Bull Nose Shelving in Solid Colors, Almond, 13" x 48"
Bull Nose Shelving - Wood Grain, Maple, 13" x 24"
Bull Nose Shelving - Wood Grain, Maple, 13" x 36"
Bull Nose Shelving - Wood Grain, Oak, 13" x 24"
Bull Nose Shelving - Wood Grain, Walnut, 13" x 24"
Bull Nose Shelving - Wood Grain, Maple, 13" x 30"
Bull Nose Shelving - Wood Grain, Oak, 13" x 30"
Bull Nose Shelving - Wood Grain, Walnut, 13" x 30"
Bull Nose Shelving - Wood Grain, Oak, 13" x 36"
Bull Nose Shelving - Wood Grain, Walnut, 13" x 36"
Bull Nose Shelving - Wood Grain, Maple, 13" x 48"
Bull Nose Shelving - Wood Grain, Oak, 13" x 48"
Bull Nose Shelving - Wood Grain, Walnut, 13" x 48"
With the right bracket, create a shelf on any Wall system with our Bullnose Shelves from American Retail Supply. Bullnose refers to how the front concave inward, hiding your bracket and giving a smooth edge. Due to this, these shelves will not prevent products from rolling off as it doesn’t have a railing/lip feature. Our 13-inch wide shelf will fit only 12-inch knife edge slatwall, gridwall, or wall system brackets, simply place the shelf on top of the bracket to have your bullnose shelf ready for use. 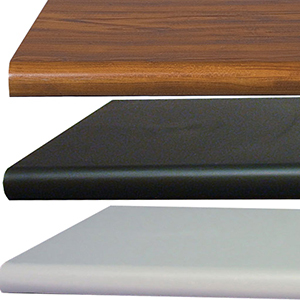 We have a variety of solid color bullnose shelves ranging from white, black, gray, and almond. Otherwise, we have a wood grain design shelves in walnut, oak, and maple. Whichever design you pick, all of them come 13 inch wide with variety of lengths. From 24 to 30 inch shelves, 2 brackets will be enough to support the shelf. Going above 36 inches will require at least 3 knife edge brackets. These Bullnose shelves is suitable for any retail store because they are water-resistance, plastic, and light weight. Order online or call if you have any questions, 1-800-426-5708.